Technical features: The inner layer is a special blend of PVC/NBR. 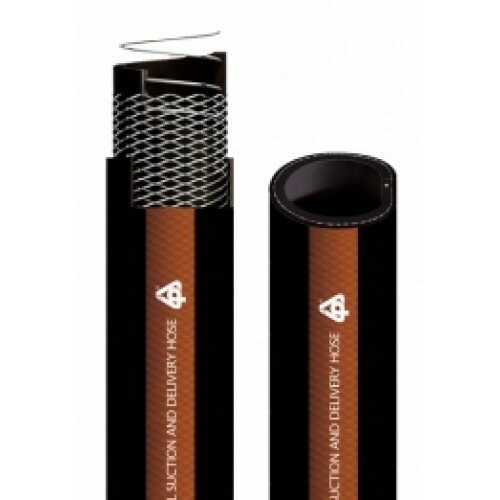 The product is reinforced by an harmonic steel wire and a polyestern yarn, suitable for suction and delivery. Properties: Very flexible, resistant to abrasion, ageing, atmospheric agents and ozone, UV rays. Standards: RoHS 2011/65/EU Directive, REACH Regulation (1907/2006), TRB S 2153. It can be produced in antistatic version, inserting into the hose an helicoidal copper wire. By grounding the copper wire the hose is electrically bonded. The electrical resistance R ≤ 102Ohm/m is according to ISO 8031 - ATEX Directive 94/4/EC and 99/92/EC). For suction and delivery of lubricants, crude fuel, naphta, diesel oil, (no suitable for bio diesel or petrol) and as a return line in hydraulic systems.